Mr. Toad's dress pants were sidelined so that I could do some quick projects for their snow camping trip--brrr. So far I've shown Mr. Toad's long johns and Middle Son's fleece hoody and pants. This is the last project. The award ribbons. This was the project that scared me. 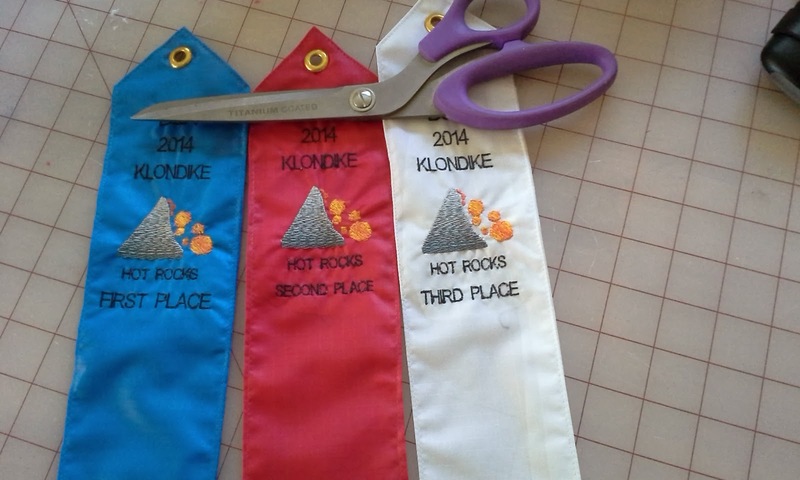 Mr. Toad had requested that I create award ribbons and I had no idea where to start. So I brain stormed. Middle Son and I found some rip stop nylon at Hancock Fabrics. While there I grabbed some printable fabric that I didn't use after all. I really didn't know where to start. Award Ribbons. I purposefully blocked the organization. Well the brainstorming eventually lead me to the computer to scan some images into my embroidery software. I didn't like it and played around and added some depth to the "rocks" using gradients. Once I had a picture, the words were no big deal, except they needed small scales. I used some cut away stabilizer and made sure everything was very secure before stitching with a small needle. I then folded it in half, folded under the edges and stitched using nylon/invisible thread. After folding the top, I some grommets in my stash--why do we think our stash is such a bad thing? Overall, I'm pleased. So is Mr. Toad and Middle Son. Now, I need to worry that I'll be asked to do more! Thanks, Vanessa. Mr. Toad and our kids keep pushing me to try things I never would have thought to try. They keep volunteering me. Thanks, Kara. I wish I could take credit. Mr. Toad volunteered me and told me what he wanted, without having a clue as to ho it might be done. He has also volunteered me to to make 6-10 kerchief and sew on patches. Not difficult, but time consuming.